I realized today, that it’s been a while since I last posted a restaurant review. It’s not that I haven’t been going out to eat; actually, it’s quite the opposite. I’ve been going out to so many restaurants that I haven’t really had time to blog in between meals. It’s kind of hard to pick up a pen when you won’t put down your fork, but I think I’m finally ready! My little food frenzy all began when my friend, Sasha, asked me to grab lunch with her at Greenstreet Café. 72 hours and 7 delicious restaurant meals later…I am finally emerging from the most ridiculous, nonstop, 3-day food coma of my life. Correction, the only 3-day food coma of my life (and I’m hoping to keep it that way!). As I sit here now, trying to figure out on which days and in which order I ate these meals, I realize that it is all just a huge blur. A food blackout, perhaps. But there is one meal that stands out in my memory, and that is my dinner from last night at La Loggia in Downtown Miami. I had a serious craving for Italian food yesterday, and wanted to try something other than the Italian restaurant below my apartment building for a change (Vilaggio). So I google searched the best places for Italian in Miami, and chose La Loggia from the results based solely on that fact that I had never been, nor heard of it. Within minutes, Sasha, Cy, and myself were on our way downtown to get some grub. I got a little apprehensive when we showed up and the place was empty except for the bar, but I was committed to trying something new and I’m so glad that we did! First things first, we got a nice bottle of red wine for the table (aka yet another night that I didn’t end up studying for finals) and then we ordered appetizers. 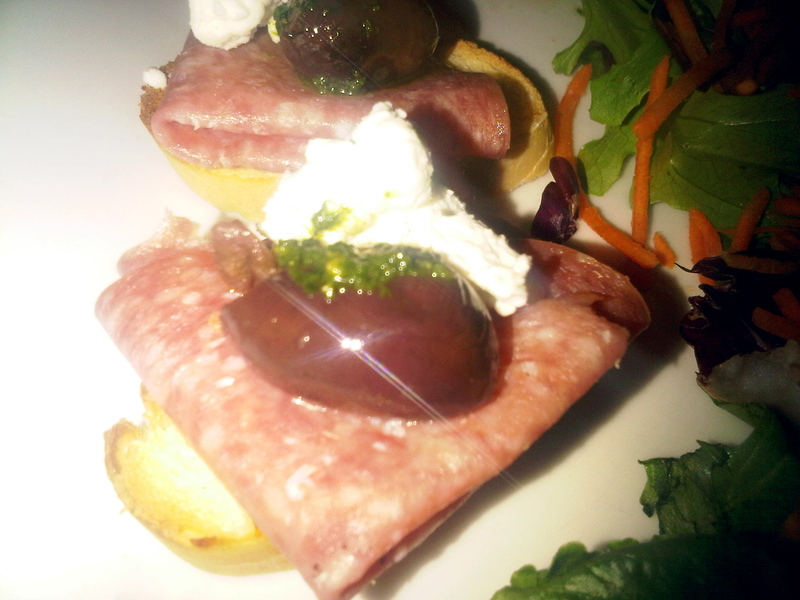 Sasha and I split a 6-piece Brushetta appetizer, 3 of which were with Melted Mozzarella with Tomato, Basil, Salt, and Olive Oil, and 3 of which were Petit Toasts topped with Genoa Salami, Goat Cheese, and Calamata Olives. Sasha and I both agreed that the Salami and Goat Cheese was much more interesting and better overall than the Melted Mozzarella one, and there was definitely an awkward moment as we both stared at the last petit toast, wondering who would take it. I let her have it, but it was a self-less act and a tough one at that! 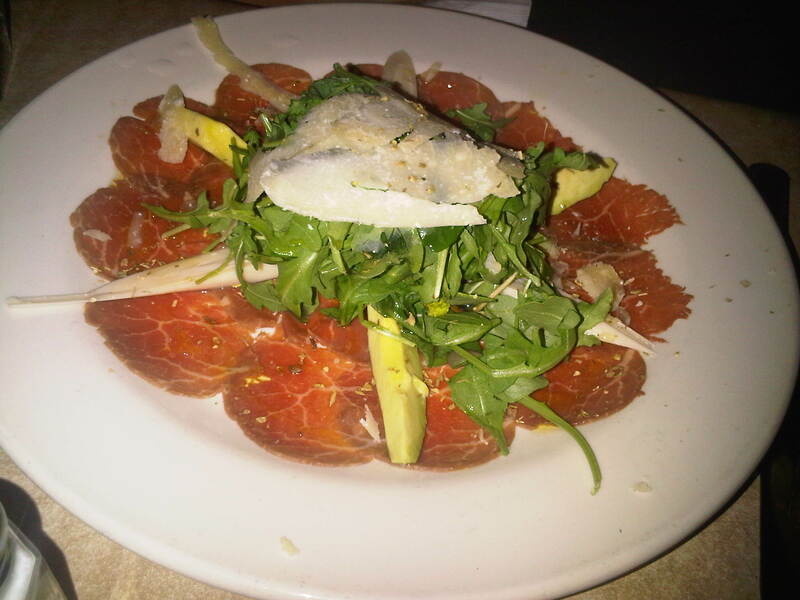 Cy ordered the Beef Carpaccio with fresh arugala, sliced parmigiano reggiano, avocado, and hearts of palm. I’m not a fan of carpaccio, but he loved it and Sasha went ahead to order it as her entrée so it must have been good. For dinner, I kept it simple and ordered the Chicken Parmesan. I don’t think that you can really get a good read on an Italian restaurant unless you try their red sauce, and I was in the mood for something rich and cheesy. I can honestly say that it was the 2nd best chicken parmesan that I have ever tasted in my life (the first best being at a little hole in the wall spot in New Jersey). The chicken was pounded out to a beautiful ¼ inch thickness and it was fried to perfection. 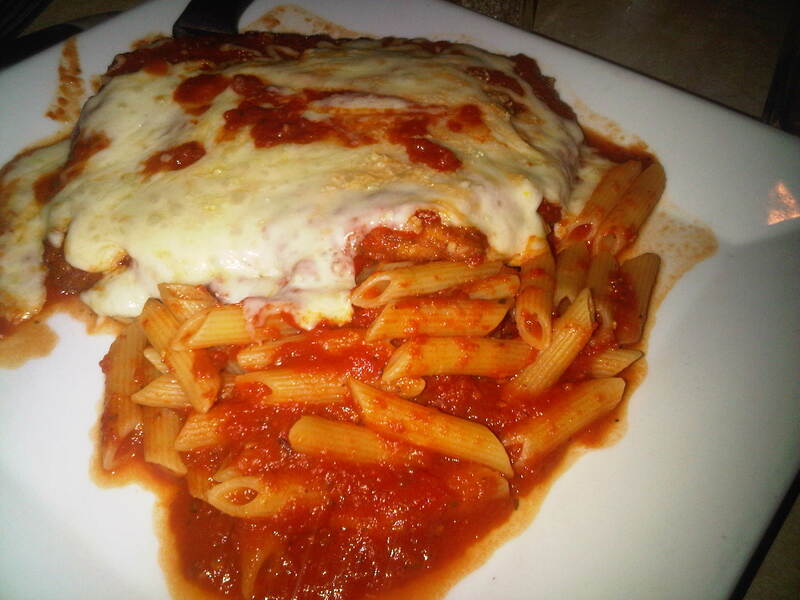 I hate, hate, hate when I order chicken parmesan out and it is thick like a fried chicken breast. This place had the right idea though, thinly pounded yet large enough to cover the whole plate. Now let’s talk about the red sauce—it was tremendous! It had just the right amount of spice and acidity and it tasted very fresh. The herbs were very aromatic, yet not overpowering and the consistency was great for a sauce without meat. A red sauce with meat (aka Gravy for all my fellow Italians!) adheres to pasta so well because the fats from the meat naturally thicken the sauce and help bind it to the starch. But a common problem for restaurants making a meatless red sauce is that the sauce is too thin and sometimes even runny. Its like and apartheid on your plate…the sauce and the noodles simply won’t come together (and this is usually when you end up with sauce speckles all over your shift). Thankfully, La Loggia has mastered the art of red sauce and it stuck to my pasta beautifully, which was properly cooked al dente. I ate everything last bite, much to the waitresses surprise who mistakenly offered me a to-go box before noticing my empty plate. When she saw that there was nothing left she looked at me as if I was Adam Richman from Man v. Food, going on about how “no one ever finishes that whole entrée!” I did my little nervous laugh and then sheepishly asked for the dessert menu (Adam Richman, I could take you any day). I ordered the Mango Cheesecake and a Cappuccino. The cappuccino was very good (LaVazza coffee), but I have very mixed feelings about the cheesecake, which actually tasted nothing like a cheesecake. 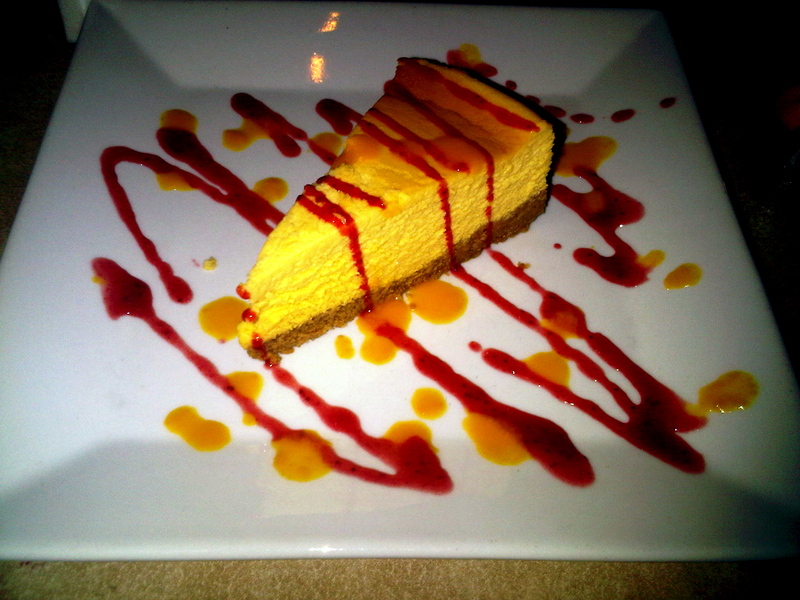 The flavor of the mango certainly lightened the texture and feel of the dessert, but I was in the mood for a heavy piece of traditional cheesecake and so I was disappointed. Just not what I was wanting at the moment, and I don’t think mango and cheesecake lend themselves well together. Overall, I thought this was a fabulous restaurant….especially at the price point too. You cannot beat $14 for that enormous and delicious chicken parmesan. The pasta dishes are around $12-$14 and the meat entrees range from $13-$16. I will definitely be going to La Loggia again. It is a hidden gem.